5 Best Kona Coffee Brands – Tips For Avoiding “Fake Kona”! There are many coffees out there from around the world that all coffee aficionados need to try, and Kona coffee from Hawaii’s Big Island should be high on anyone’s list. 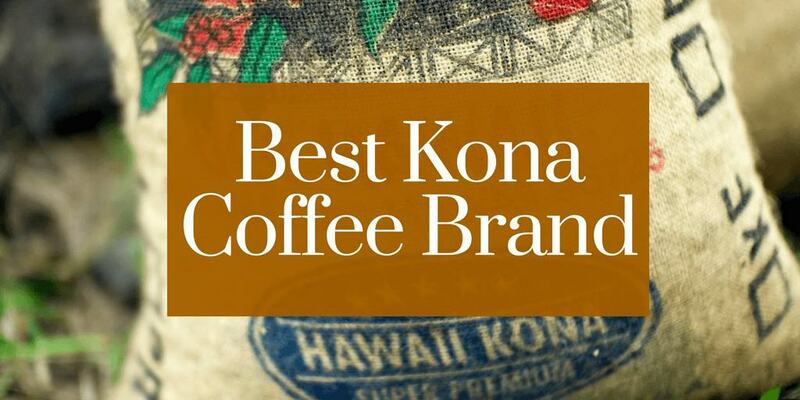 Here’s our guide to choosing the best Kona coffee brand. Why is Kona so expensive? How to avoid buying inferior or fake Kona? Kona coffee is a particular type of high-quality arabica grown only in North and South Kona Districts on the slopes of the Hualalai and Mauna Loa volcanoes on Hawaii’s Big Island. Coffee grown elsewhere, even on the same island is not Kona, and not all coffee grown in these two districts is worthy of being called Kona coffee. Coffee was brought to Hawaii from Brazil in the 19th century and has traditionally been grown on small family-owned farms (1). There are now around 600-800 farms in Kona, and in 1997, they covered around 2290 hectares of land, producing about two million pounds of coffee. Kona trees blossom each year in February and March. They begin to produce berries in April and the picking season is from August to January. Picking is done by hand to ensure only the ripest berries are collected. The cherries are processed using the wet method. They are pulped and then fermented for 12-24 hours. After this, they are rinsed and sun-dried on special racks known as hoshidanas (2). Kona coffee is described as being delicate and flavorful with a rich aroma and complex notes of wine and spices. There are two types of Kona, Type I and Type II. Type I is the regular kind of bean with two seeds developing per fruit. Type II is Kona peaberry; peaberry is a rare mutation where only one round seed develops in a fruit. Some say the flavor is even better than regular coffee beans. The grades of Type I berries, from highest to lowest, are Kona Extra Fancy, Kona Fancy, Kona Number 1, Kona Select and Kona Prime. Beans not even deemed worthy of the Prime appellation are not considered Kona beans. Type II are either Peaberry Number 1 or Peaberry Prime. 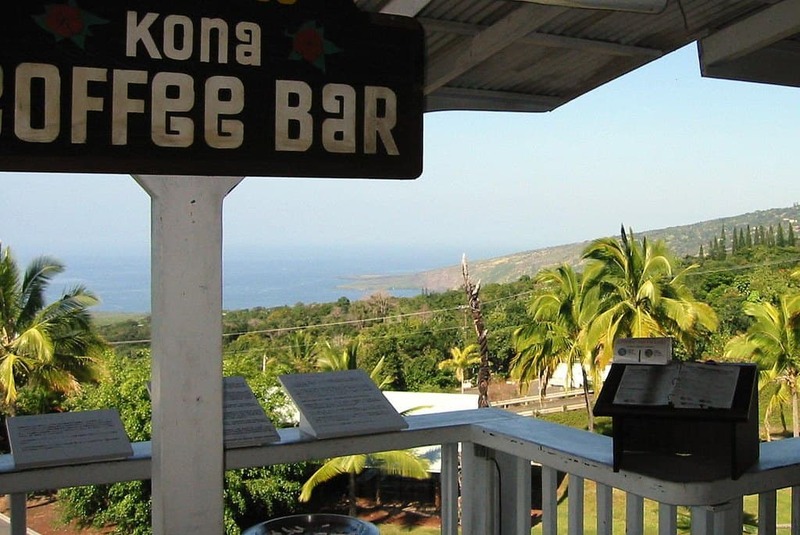 There are three main reasons why Kona coffee beans are so expensive. For starters, the flavor profile of these beans is highly sought-after. As we mentioned, they display a delicate but complex flavor that is highly prized by coffee connoisseurs. Without this, even with the other factors, Kona beans wouldn’t command such high prices. Kona coffee is only grown in North and South Kona Districts. This geographical limitation makes these beans necessarily rare. The volcanic slopes of Kona’s volcanoes provide an ideal microclimate for the notoriously temperamental arabica plant. Mornings are sunny while the afternoons are cloudy and sometimes rainy, proving the perfect balance of light and water. There is little wind and the nights are mild. Such favorable conditions for growing Arabica beans are not easy to find. The ground where they grow in particular, too. The porous volcanic soils of Kona are rich in minerals that help the plants grow and contribute to the flavor of the beans. Coffee cherries don’t all ripen at the same time. With some coffees, cherries are harvested by machine. 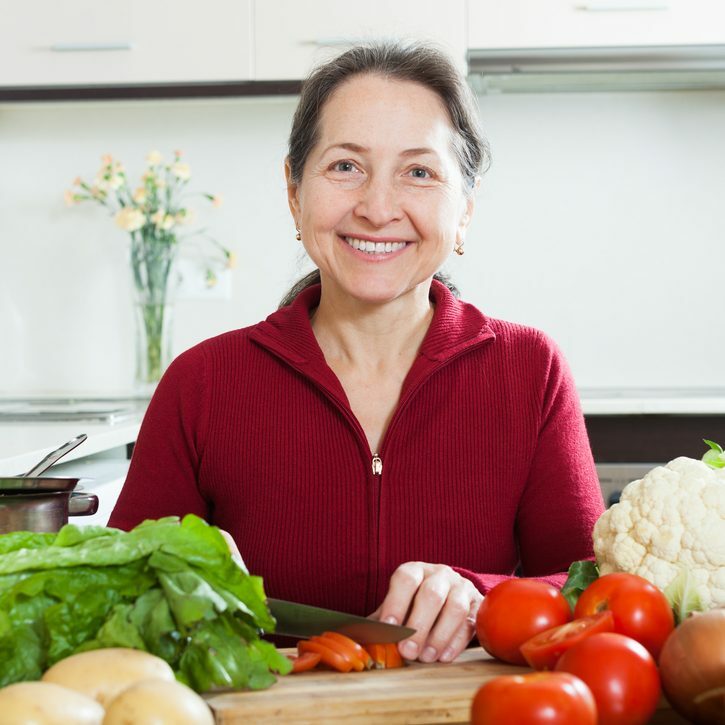 However, machines are not able to distinguish between unripe cherries, ripe cherries, and over-ripe cherries and so just take them all. This results in an inferior product. As a premium coffee, Kona is picked by hand from August to January by skilled pickers who are trained only to take berries when they are in their optimum state of ripeness. This results in a far superior product, but this method of picking is much more labor intensive and costs much more. Since Kona coffee beans are such an expensive luxury product, it is no surprise that some people have tried to make money off the famous name in dubious or sometimes downright dishonest ways. One trick to watch out for is coffee sold as “Kona blends”. While the Kona name is protected, and the quality of coffee sold under this name is guaranteed, this protection does not extend to coffees containing an amount of genuine Kona blended with other less expensive beans. The point to note here is that a coffee sold as a Kona blend may, in fact, contain as little as 10% genuine (but probably poor-grade) Kona, while the rest of the coffee will be from somewhere else like Colombia or Brazil. 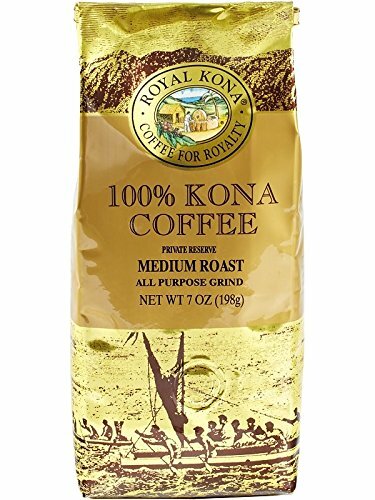 If you want the real thing, always make sure you buy coffee displaying the “100% Kona Coffee” logo – even pods such as K-Cups will display this logo if they contain genuine Kona coffee. Finally, there was even a case where one company, Kona Kai Farms, was caught selling coffee packaged as 100% Kona while in fact, the coffee was not Kona at all. This case may serve to remind us to check carefully before handing over our cash for a product that is not what it seems. Here are five of the best Kona coffee products currently available. 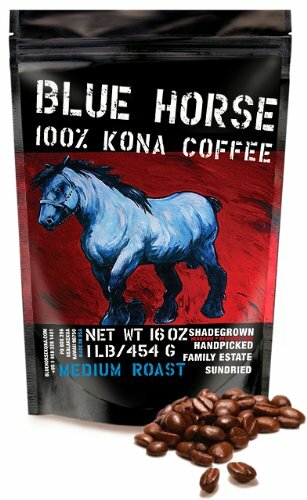 This is a medium roast ground coffee certified as 100% genuine Kona – it is not a blend. It is sold in bags of 7oz. The coffee is described as being full-bodied, aromatic and smooth. It has a medium flavor that is mellow and not overpowering and that contains a hint of earthiness. 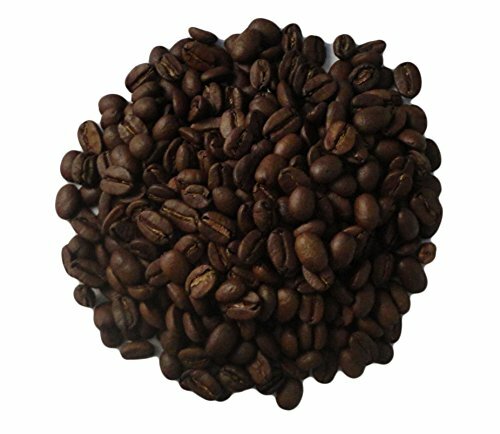 This coffee has a low acidity and a delicious aroma, perfect for Kona lovers or for those wanting to try it for the first time. 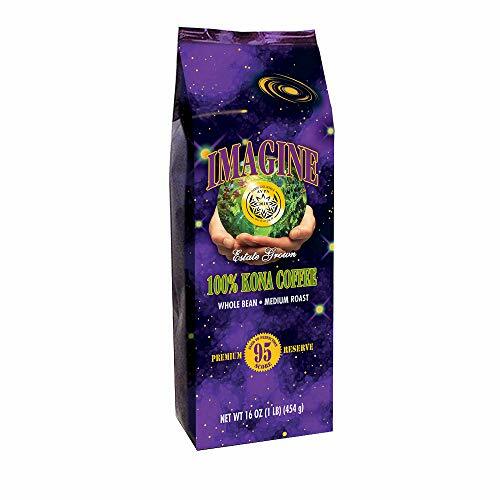 These beans from Imagine are pure 100% single estate Kona – no blends. They are grown at an altitude of 2,200ft and are certified as Extra Fancy beans, the highest grade, for their size, weight, and lack of defects. Only 10% of Kona beans are graded as Extra Fancy. They have a sweet, robust taste that is neither acidic nor bitter. They are sold as a medium-dark roast that gives a rich flavor and an intense caffeine focus. An excellent choice of Kona for someone who prefers a slightly darker roast of coffee. This is an “Extra Fancy” Kona bean, the highest grade of Kona available. These beans are certified as 100% Kona – unadulterated with any other types of coffee – and are medium-roast. They are available as beans or grounds and come in a sealed bag with a one-way valve for degassing. The flavor is rich and intense with a distinctive aroma. The complex flavors are exactly what you would expect of a high-quality Kona, and the coffee they produce has a chocolatey, velvety mouthfeel. A luxurious Kona coffee for anyone who wants to give themselves a special treat. Blue Horse Kona is government inspected and certified as 100% genuine Kona. It is an authentic single estate coffee that is hand-picked and is completely free of herbicides and pesticides. It is freshly roasted just before shipping. This is a medium roast – also available as dark roast beans. This coffee has a mellow and aromatic body with spicy afternotes, offering the highly sought-after flavor profile of a true Kona. This coffee is a real treat for aficionados and novices alike. Note that the caffeine content is lower than some coffees so maybe not suitable if you prefer some kick. 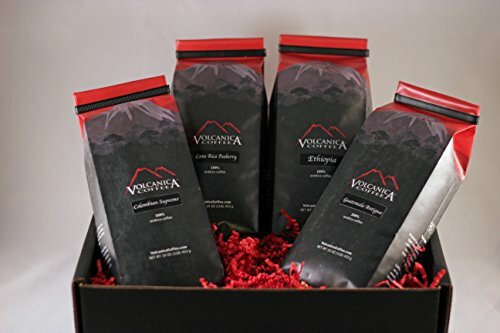 Volcanica is a well-known importer and roaster of specialty beans. Their Kona is graded Extra Fancy and is a certified 100% single-origin Kona grown on the Greenwell Estate. The beans are medium-roast just before shipping and are sealed immediately after roasting to preserve their freshness. The complex flavors of these beans include a refined taste and a smooth body with a superb aroma. They display a buttery richness and nutty overtones with hints of cinnamon and cloves. These are among the most expensive of Kona beans but are a good choice if you want to taste the best. If you are the kind of coffee drinker who heaps a few spoons of grounds into your coffee machine to brew up a bitter, dark liquid just for a caffeine hit to kick-start your day, perhaps the delicate flavor of a carefully brewed Kona is not for you. However, if you appreciate a complex and subtle coffee full of hints of nuts, spices, and butter and don’t mind paying extra for a top-quality bean, there is no doubt you will fall in love with the best Kona coffee. It is quite a simply a brew that every true connoisseur has to try at least once. Do you drink Kona? Which is your favorite brand? Do you have any stories about a trip to the Big Island and the Kona estates? If you have something to tell us, please leave us a comment – we love to hear from you. And if you enjoyed reading this article, why not give us a share?